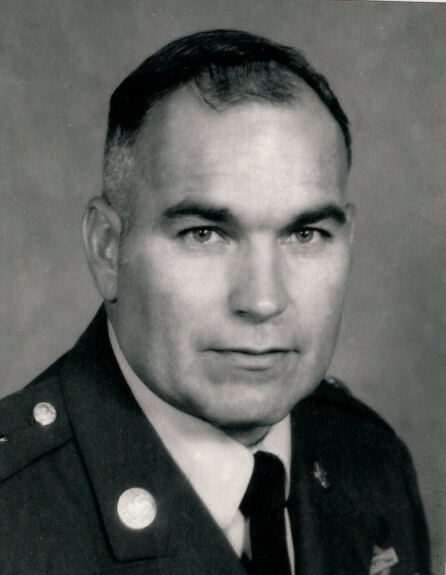 Command Sergeant Major James E. "Jim" Hargraves was born 22 April 1934 in Wapato, Washington. He joined the Washington State National Guard in 1950 and attained the rank of sergeant (E-5). In October 1956, he entered the Regular Army at Fort Ord, CA where he attended basic and Advanced Infantry Training. From 1957 to 1963, CSM Hargraves served in Airborne units as a squad leader and Platoon Sergeant in the 101st Airborne Division at Fort Campbell, KY, the 82nd Airborne Division at Fort Bragg, NC, and with the 505th Airborne Battle Group at Mainz, Germany. He attended Special Forces training at Fort Bragg, NC in 1963, and specialized in operations and intelligence training. He was later assigned to the 7th Special Forces Group. From September 1963 to December 1973, he served at numerous levels with several different commands throughout Special Forces to include two tours in Vietnam with the 5th Special Forces Group, three tours in Europe with the 10th Special Forces Group and Detachment A, Berlin Brigade. After attending the United States Army Sergeant Major Academy at Fort Bliss, TX in 1974, he was assigned as the Operations Sergeant Major for XVIII Airborne Corps at Fort Bragg, NC. CSM Hargraves was appointed to Command Sergeant Major in June 1977 and became the Command Sergeant Major for 1st Battalion, 508th parachute Infantry Regiment. He served in various Command Sergeant Major positions in Airborne and Special Forces battalions, Airborne and Infantry Brigades, and later as the Command Sergeant Major of the US Army Institute for Military Assistance, which was reorganized in 1982 as the 1st Special Operations Command. In October 1987, CSM Hargraves retired from the Army. CSM Hargraves returned to Federal Service as a Department of Defense civilian in January 1990 and was assigned as the Deputy Operations Officer of the United States Army Special Forces Command and subsequently as its Deputy Assistant Chief of Staff, G3. From April 1999 through May 2003, CSM Hargraves served as the 4th Honorary Sergeant Major of the 1st Special Forces Regiment. He retired in April 2005 after 15 years of exemplary service. His military awards include Legion of Merit, Bronze Star with 2 Oak Leaf Clusters, and the Meritorious Service Medal with 1 Oak Leaf Cluster. His civilian awards include the Secretary of the Army Public Service Award, and the Superior Civilian Service Award. The family will receive friends at Jernigan-Warren Funeral Home on Monday, January 28, 2019 from 6:00 pm until 8:00 pm. Funeral services will be held on Tuesday, January 29, 2019 at 1:00 pm at JFK Chapel. Burial will follow in Sandhills State Veterans Cemetery on Ft. Bragg with full military honors. CSM Hargraves is survived by his loving wife the former Inge Goetzke of Berlin Germany for 57 years of marriage, and two sons, Mark and Eric. He has a sister, Peggy Toth, a brother in law, Bill Toth, and a special daughter in law, Joy Hargraves. He has two granddaughters, Arielle Murray and Rhiannon Hekimian, and two great grandsons, Lincoln and Brigdger Murray, and two wonderful grandson in laws, Jordan Hekimian and Nathan Murray.